In Pakistan in 2004, the Makran Coastal Highway which links Karachi with the port town of Gwadar was opened. The new road finally allowed tourists easier access to the Hingol National Park, 240 kms (150 miles) away from Karachi, and home to the huge anomalous rock formation known as the 'Balochistan Sphinx'. This bizarre rocky outcrop is not the only one resembling a man-made structure in the park, as another unusual statue-looking feature called the 'Princess of Hope' (see image below) stands tall nearby. Of course, both features continue to be explained away as nothing but natural formations 'carved by wind and rain' , but could there be more to it than that? Left by an ancient civilization? As I cover in depth in my latest book The Myth Of Man , there is a great deal of evidence out there indicating that civilizations have existed in the ancient past, before recorded history, which have disappeared from both view and human memory. Advanced technology seems to have been in use thousands of years before the official inventions claim, and even the Great Sphinx of Egypt is coming under closer scrutiny these days since the rain-induced weathering patterns along the Sphinx enclosure seem to point to a far earlier date for its construction. 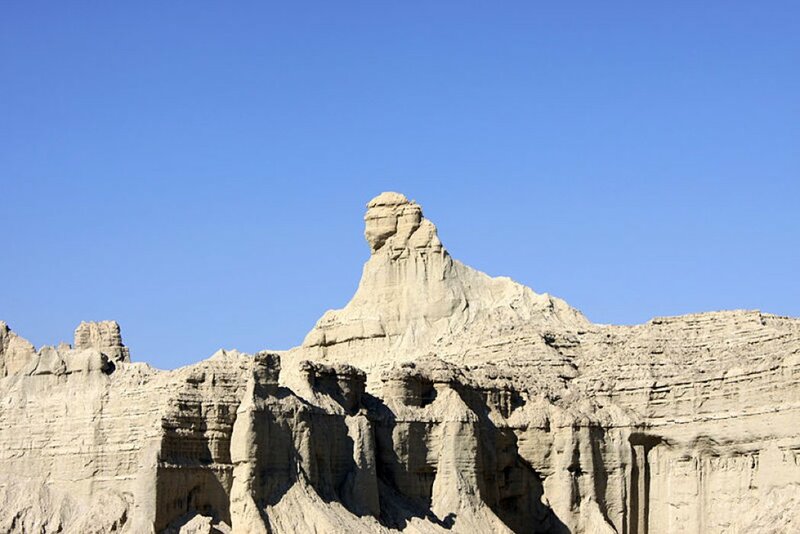 The Sphinx of Balochistan in Pakistan could prove to be an even earlier version than its Egyptian counterpart, when all of its surroundings are placed in context with the sculpted form which sits proudly above it all. As Indian author and researcher Bibhu Dev Misra points out, 'the site looks like a gigantic, rock-cut, architectural complex'. But who made it and when? Just like the Sphinx at Giza, the Pakistani formation appears to include a head-dress similar to the Nemes head-dress worn by the ancient Pharaohs, with its striped markings on a cloth which covers the crown and the back of the head of its wearer. The flaps hanging down near the ears are also clearly visible on the Balochistan Sphinx, whilst the horizontal groove resembling the pharaonic headband can be seen adorning the forehead. Remarkably, the Sphinx rests on what appears to be a temple platform with even more fascinating aspects seemingly inherent in its design. As the image below highlights, there are unusual niches and pillar looking formations present in the mass of rock which lays beneath the Sphinx formation . The symmetrical features which can be seen across the site are certainly reminiscent of human activity and appear to contradict the dominating 'made by nature' hypotheses which continue to be heard in the public domain. Even and symmetrical formations such as steps would suggest that the site could well prove to be much more than a passing resemblance of a temple. 'The steps appear to be evenly spaced, and of uniform height. The entire site gives the impression of a grand, rock-cut, architectural complex, which has been eroded by the elements, and covered by layers of sediment, masking the more intricate details of the sculptures', wrote Dev Misra . With more investigative work and analysis, this remote site in Pakistan may reveal itself as another example of a forgotten civilization which flourished long before ancient Egypt or even Gobekli Tepe in Turkey. Only time will tell. The book, The Myth Of Man , by J. P. Robinson is available from Amazon. Misra, Bibhu Dev, The Sphinx Of Balochistan: Is It A Man-made, Rock-cut, Architectural Marvel? 2017. Nelson, Angela, Sphinx of Balochistan. MNN Galleries, 2016. The belief that these features could be partially or even entirely man-made is ridiculous. Just look at photos of, say, Red Rock Canyon in California. You will see similar natural rock formations. That's just one example. Just another case of pareidolia (simulacrum).